Blanch the lasgne sheet until almost done which is called 'al dante' in italian in boiling salted water & olive oil. Once out of the water sprinkle with olive oil so that it doesnt stick to each other. Take a separate frying pan & add 2 tbsp of olive oil. In the meantime blanch the spinach & sqeeze the extra water until dry & keep separate. Add in the garlic & once sweat add in the chopped red onions & allow it to sweat.Add the spinach and cook it well with seasoning & finish with little grated nutmeg. Remove it from heat & allow it to cool for sometime & add in the soft ricotta cheese to the mix & blend in well & also adjust the seasoning. Spread the lasagne sheets like shown in the picture & put one spoon of the spinach & cheese mix in one end of the sheet & slowly roll without much pressure so that the mix doesnt come out. In a flat dish make a base with tomato sauce & arrange the rolled pasta as arranged in the pic. Top it up with little tomato sauce so that it doesnt get dried during the baking process. Sprinke with grated parmesan cheese & bake it in hot oven until the cheese melts & serve hot. Wow! It is new to me looks yum priya..Btw I have something for you in my blog pl trial back to my blog! This is new to me...Nice presentation..
canneloni looks yummy dear.. i have eaten in restaurants.. cheesy and delicious. 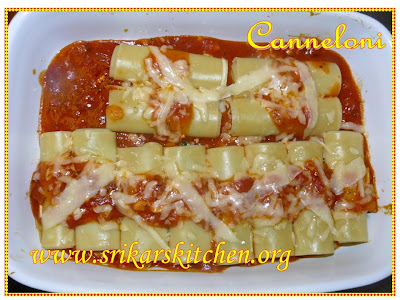 Cheesy canneloni looks delicious...I tried once at home..Great job Sri!! 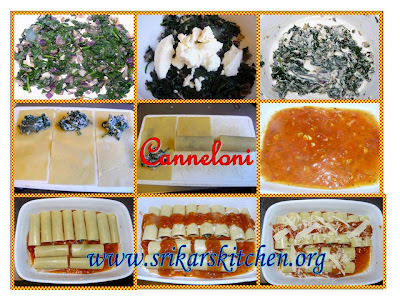 I love cannaloni, i haveonly made them with bolanaise sauce, should try once this combination as it looks so yummy delicious. wow Looks yumm..Very nice recipe.. I love canneloni. Looks lovely.. Nice instructions. Will try your version! Have something for u in my blog.. pls check! Looks so delicous, love the way ur rolled and stuffed! I have a small gift waiting for you in my New Blog Post... Please do accept it. yummy! ricotta cheese and spinach is an awesome combo, have tasted that combo in dips especially.. This is new to me. Looks yummy.